If you haven't been able to tell, I'm kind of in love with Anne Hathaway but so are lots of folks. Ironically, I still haven't seen Love and Other Drugs, but another film she's in that I am looking forward to seeing and will go out of my way to watch is Lone Scherfig's One Day, an adaptation of David Nicholls' book of the same name. 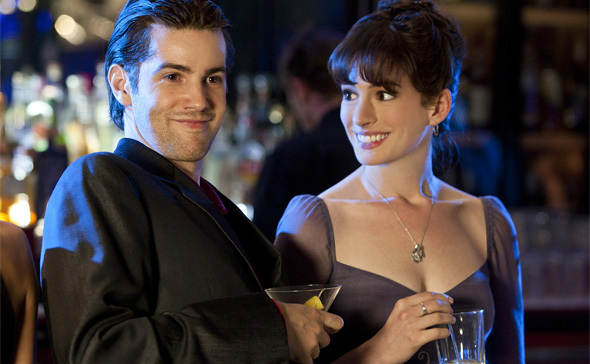 Hathaway and Jim Sturgess star as Emma and Dexter, who first meet at graduation from the University of Edinburgh in 1988 then proceed to reunite one day each year for the next 20 years. We ran a first look at this in September, but these new photos found on IMDb (via The Playlist) are our second look! I love the variety (Hathaway looks especially cute in short hair) and as a follow-up to An Education, this has already captured my interest. One Day, as described, could be the British answer to When Harry Met Sally. As for this cast, Scherfig says of Hathaway: "She has a vast range that is extraordinary, and I was very grateful that she wanted to do it. We had a great collaboration and both cried when we had to say goodbye." Hathaway will be speaking with a British accent, who Scherfig says, "has an elegance and is laidback and confident." Focus Features is bringing One Day to theaters sometime in 2011, but hasn't set an exact date. No apologies are needed for being a fan or "in love with" Anne Hathaway. She's turning into one of her generations best actresses and, so far, it's truly deserved. Wow. They really couldn't have done a better job adapting the book. It's just the way I imagined it. It should be interesting to see how the age them. Alex I love Hathaway! you dare try to take the title of most in love with Hathaway!? them's fightin' words! Read ze book. Great book. But watch out for ze zwist at ze end.